On the eve of her ninth birthday, Rose Edelstein bites into her mother’s homemade lemon-chocolate cake and discovers she has a magical gift: she can taste her mother’s emotions in the slice. All at once her cheerful, can-do mother tastes of despair and desperation. Suddenly, and for the rest of her life, food becomes perilous. Anything can be revealed at any meal. Rose’s gift forces her to confront the truth behind her family’s emotions – her mother’s sadness, her father’s detachment and her brother’s clash with the world. But as Rose grows up, she learns that there are some secrets even her taste buds cannot discern. 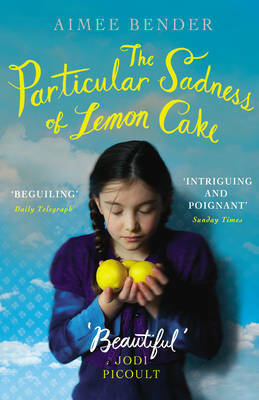 The Particular Sadness of Lemon Cake is a combination of both strange and unorganised, but I still enjoyed reading it. The main idea of the story was exciting but wasn’t taken far enough. It took me a few chapters to achieve mild interests, but then when Part II came along all the way to the conclusion, I was completely confused with the shift in the story’s theme. The writing is excellent, especially in describing the food and the emotions it evokes for Rose. However, there are a few things that I didn’t enjoy about the book. Bender chose not to use quotation marks, I was hoping that after completing the book I would see a reason for the decision, but I still see none. It’s confusing to the reader and adds nothing to the experience that I can guess from. Also, the switch from the focus of Rose and her special ‘gift’ to her brother was confusing. Bender does attempt to tie the two together in the end, but for me, it was less than successful and ultimately unsatisfying. I found myself tuning in and out of the events, but it felt like it was slapped together randomly. I was disappointed with the ending. You never know what would happen if the Dad goes into the hospital, which is okay, but I would like to know. Also the brother, I get his unique ability, but why he wants to disappear forever? What drove him to do it? His grandfather smelled, his sister tasted, what was his? The idea was good: a girl can taste the feelings of whoever prepared her food. Unfortunately, there wasn’t much plot with characters which were uninteresting & heavily dependent on stereotypes – distant father busy providing for an unfulfilled wife who’s having an affair and geek brother. The brother also has a unique talent, which was a massive distraction from the main story, and wasn’t very well explained anyway. But most disappointing of all was the lack of a real storyline. The book describes the main character’s developing her ability to identify where her food comes from and what emotions the cook was feeling, but it never really builds to any climax. A small part of the novel that annoyed me, Rose’s mother is having an affair, and Rose figures it out so. She tells her daughter she’ll stop the affair if Rose wants her too (not because it’s wrong and not because she feels terrible about it) but only if Rose tells her to stop, which Rose says to her to carry on with her affair. I had initially read the book at my grandmother’s house and left the book there mid-finish until I asked if I could finish it which my aunt happily gave the book over to me but I felt like I wasted my time with this book and that’s always a disappointing experience.